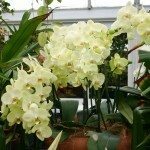 Indoor Orchid Care - How Do I Take Care Of An Orchid Flower? Most orchids require moist, well-draining conditions. 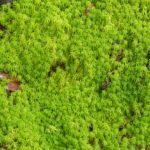 There are several types of growing media that can be used with orchid plants—redwood or fir bark, sphagnum peat moss, rocks, cork, charcoal, sand, potting soil, etc. A basic mix for growing orchids consists of coarse perlite, fir bark, and sphagnum moss. You can also add charcoal but this is optional. Generally, the grade of bark is dependent on the type of orchid grown. For instance, phalaenopsis orchids are usually grown in coarse bark, cattleyas in medium bark, and young orchid plants are best grown in fine bark. Orchids require shallow planting. Place orchids in an east to south-facing window or room. These plants prefer bright, indirect light. Insufficient light results in poor flowering. However, too much light can lead to leaf scorch. Temperature is also important for indoor orchid care. While orchids tolerate cooler or warmer temperatures throughout their normal growing season, they need to be about 15 degrees cooler at night than during the day in order to bloom sufficiently. Orchids need ample water but should be allowed to dry out some between waterings. One way to check for watering is by poking your finger about an inch into the growing media. If it’s dry, give it some water; otherwise, let it be. Indoor orchid plants also need adequate humidity, about fifty to seventy percent. There are various ways to increase the humidity in your home. 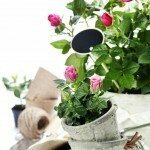 Place a water-filled saucer or tray of pebbles beneath plants, mist plants daily, or use a humidifier. Fertilize orchids weekly or bi-weekly while they are producing new growth and decrease to monthly or bi-monthly intervals once they mature. Discontinue altogether once the plants go dormant. Additional orchid care tips include repotting, which is normally done every other year. If your orchids suddenly stop blooming but have suitable light, temperature, and humidity, then repotting may be necessary. Also keep an eye out for signs of pests or disease. Orchids are occasionally affected by mealybugs, scale, and aphids. These can usually be washed off or treated with insecticidal soap.